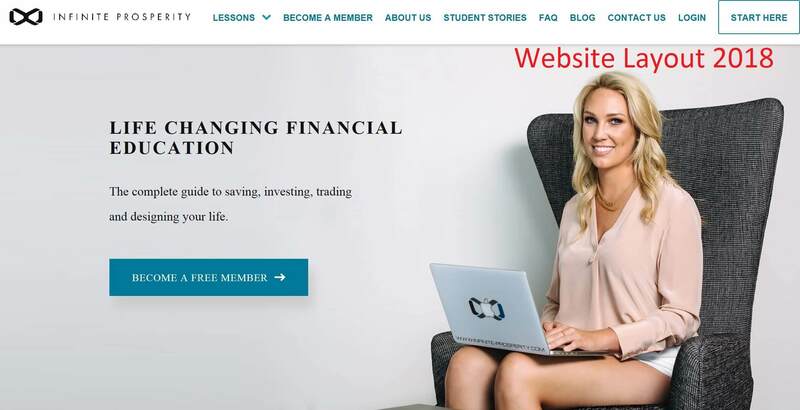 Infinite Prosperity is an Australian Forex trading education website offering online trading education courses for beginners and for professionals in the financial business who want to improve their skills. You won’t find many trading services like Infinite Prosperity. While most sites focus on equities and look to exploit the hottest stocks -- Infinite Prosperity sets its sights on the currency market. Hedgers. Converters. Central bankers. Many players in the currency market don’t participate for the purpose of earning a profit. This is where Lewis Mocker comes in. With his proprietary strategy, he claims he can show you how to profit trading currencies and teach you a clever way to fund your account in the process. In this Infinite Prosperity review, we’ll find out. ​Who is Infinite Prosperity Best For? 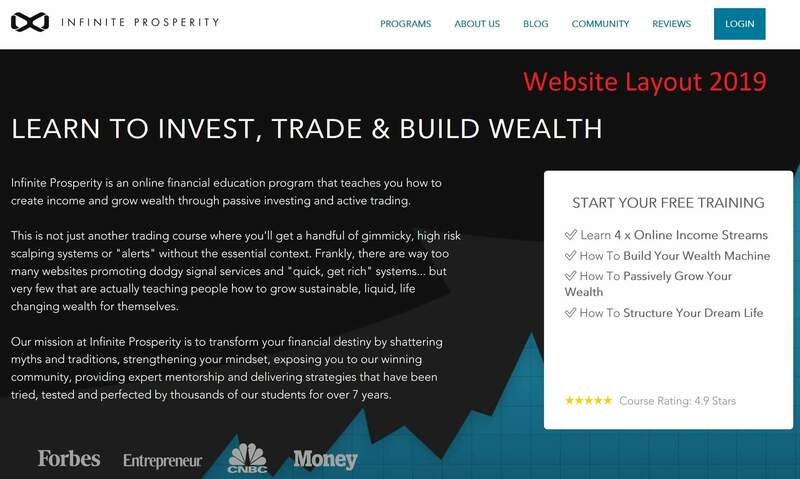 Infinite Prosperity is an educational site that teaches forex trading and passive income strategies. Founded in 2012 by Lewis Mocker and Amy Sangster, the platform has over 7,000 active members from over 55 countries around the world. More than just a name, Infinite Prosperity represents both personal well-being and also a mathematical formula that’s revealed throughout its courses. The site also provides hours of online tutorials, five live trading events each week. ​The site frequently changed since I noticed it the first time. Here is the website layout as of 2018. There is also an annual Infinite Prosperity Ball. The gathering is the company’s black-tie celebration event where students from all over the world meet and exchange pleasantries. The event is meant to reinforce the company’s wellness message and inspire future growth. ​Infinite Prosperity has three main products in its pipeline: the Trading Accelerator Program, Platinum Program and the Pro Trader Live Trading Room. First up is the Trading Accelerator Program. Labelled as Infinite Prosperity’s signature public product, the package costs $497 – which includes a $200 limited time discount. When breaking down the content, you see the company takes a holistic approach to currency trading. Rather than memorizing strategies using trading alerts and zero support, Infinite Prosperity focuses on providing a deeper understanding of when, where and how to trade. The passive investing strategy is an introductory course that teaches you how to construct a long-term diversified portfolio. Using strategies perfected by Warren Buffet and Ray Dalio; Mocker and Sangster claim they can walk you through how to create an optimal portfolio of stocks, bonds, commodities, real estate and more. So what do you learn in the passive income strategy course? Now what about the forex trading strategy course? This second offering focuses on how to spot forex trends and take advantage of currency reversals. Using their proprietary strategies, Lewis Mocker and Amy Sangster claim they can show you how to make calculated bets in the currency market and structure the trades so you come out ahead. Undoubtedly, the forex trading strategy is much different than passive investing. The goal of combining the two courses though, is to use your passive income as a way to fund your bets in the currency market. By doing so, Lewis Mocker and Amy Sangster claim, you can earn higher and higher profits because you’re increasing your returns along the way. The downside of their strategy, of course, is the use of debt. When trading currencies with 2x leverage -- a 50% decrease in the value your position wipes out your entire equity. While 50% is an extreme move and very unlikely to happen, the main takeaway is your gains and losses will be twice the magnitude. So what should we make of the Trading Accelerator Program? ​I mean, is Infinite Prosperity a scam? Well, according to student reviews, the site has a lot of fan fair. While we’re skeptical of the outstanding results you can achieve as a new trader. Infinity Prosperity claims to have over 7,000 members. However, what does "members" stand for? The number of subscribers to the email list? Probably yes, and then it doesn’t say anything about the trading course quality at all. I asked Amy Sangster for an interview a while ago but she never accepted to be part of my trading educator interview series. The good part about the offering is it comes with lifetime access to the course material. Unlike many other service provides where subscriptions are confined to a specific time frame, lifetime access allows you to learn and grow at your own pace. Unfortunately, the site doesn’t offer a free trial, but does provide you with a 30-Day Life Changer Guarantee. If after 30-days, you’re not satisfied with the program or don’t think it will make you a better trader, you can request a full refund of the purchase price. From our perspective, we think it’s worth a look. Compared to other trading services that charge in the thousands, $497 is a small outflow to test out the strategy. More importantly, the 30-day money back guarantee adds credibility and peace of mind if you decide the program isn’t right for you. The Platinum Program is your next step up. Keep in mind though, the offering is not available to the public and in order to enroll, you need to first complete the Trading Accelerator Program. The Platinum Program costs $1,999 and comes with 15 advanced lessons claiming to help double your trading profits. 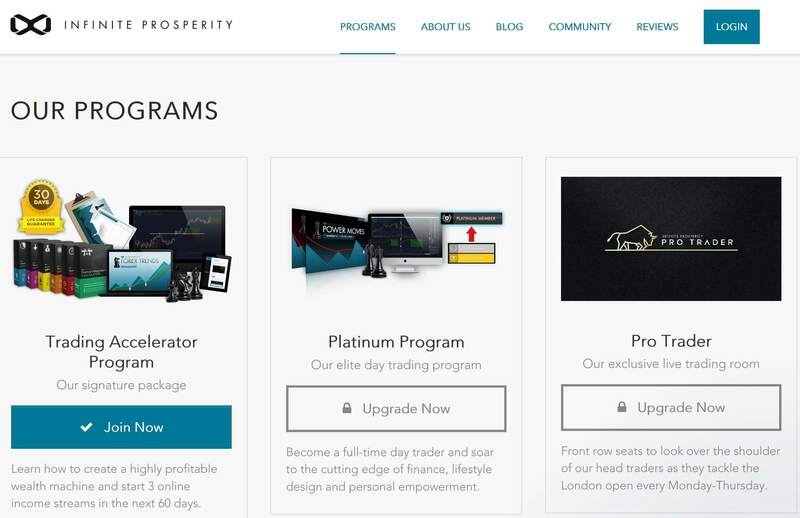 A secondary benefit of a platinum subscription is access to Infinite Prosperity’s Pro Trader Live Trading Sessions. We’ll detail Pro Trader in the next section, but at a $997 value, it’s a great inclusion. When deciding if its right for you, keep in mind the Platinum Program is best suited for advanced traders. More importantly, it doesn’t come with a 30-day money back guarantee. Our recommendation is to stick with the Trading Accelerator Program. By doing so, you can test drive Lewis Mocker’s and Amy Sangster’s strategies risk-free before you dive in. Last in the offering is the Pro Trader Live Trading Sessions. Subscriptions are priced at $100 a month or $997 annually. The new product is a combination of the older live trader feed and the Infinite Prosperity active trader feed. Our recommendation is to stick with the Infinite Prosperity Trading Accelerator Program. By doing so, you can test drive Lewis Mocker’s and Amy Sangster’s strategies risk-free before you dive in. Analyzing the watchlist, here you receive detailed information on which currencies to pay attention to, when a trading window opens and closes, as well as videos and screen shots of recently closed positons. The academy acts as a personal training ground. You follow along during live trading sessions, assess market forecasts and review trade summaries. The information is updated six to eight times per week to keep content fresh. Here, you sit in the passenger seat while Infinite Prosperity’s’ head traders scour the market for profitable opportunities. You can follow along four times per week as they trade Monday to Thursday, London time (GMT). So what should we make of the Pro Trader Live Trading Sessions? Well, for starters the offering does not include a 30-day money back guarantee and there is no free trial. However, you can purchase a monthly subscription for $100 and cancel anytime. With the annual subscription, you do receive two months of free access, but once you purchase, you’re locked in for the entire year. However, we recommend always to stay away from prepaid yearly subsciptions just because you feel to save some money at the beginning. At first test, then decide on how to proceed. Ultimately, we’re on the fence with this one. If you’re looking for a trading coach and have a large bankroll, a $100 investment won’t hurt to test out the product. However, with a 30-Day Life Changer Guarantee, the Trading Accelerator Program provides a lower-risk way to see what Infinite Prosperity has to offer. ​As mentioned, Infinite Prosperity does not offer a free trial for any of its products. However you do receive a 30-Day Life Changer Guarantee when you purchase the Trading Accelerator Program. The site also offers free video training with its Infinite Prosperity lessons download. Check it out, it’s worth a look. Through its blog and community pages, you also get access to educational material about investing, business and how to maintain an overall healthy mindset. You can also join the official Infinite Prosperity Facebook page. ​With its wide range of products, Infinite Prosperity is ​considerable for anyone who enjoys currency trading or earning passive income. The company also takes a holistic approach to its education, emphasizing thorough explanation over strategy memorization. Costs are ​a bit too high for the content. At least compread to ​other forex trading courses. Outside of the $1,999 Platinum Program – which isn’t even available to the public – the site offers a variety of subscriptions that allow you to put Infinite Prosperity’s traders to the test, without breaking the bank in the process. As I said before, ​there are forex trading courses available for even less money. Before you make your decision, check out our comprehensive guide about the best trading courses available right now. ​Ultimately, we’re undecided on Infinite Prosperity. ​Infinity-Prosperity.com offers a variety of products and has resources for traders of all skill levels. Remember though, its strategies focus on currency trading. If you’re looking to trade equities, it’s not the service for you. However, with currency markets being less efficient, there are opportunities to earn substantial profits. Before you dive in though, make sure you’re comfortable with leverage. A lot of Lewis Mocker and Amy Sangster’s strategies are built around borrowing to enhance profits. While the strategy works great on the upside, it can be costly on the downside. So it can hurt your account if done the wrong way. If you feel the service is right for you, our recommendation is start with the Trading Accelerator Program. That’s because the subscription costs $497 ($200 savings) and comes with a 30-Day Life Changer Guarantee. If you’re not satisfied with the product, you can request a full refund any time within the first 30 days. Make sure to read the detailed refund rules first! However, as being said, we are undecided. Because we asked Amy Sangster to give us an interview a while ago. First she accepted to be part of our trading educator interview series, but finally, she never answered our questions. Furthermore, Infinite Prosperity has no verified income statements published on their website. So it’s all about hypothetical results that might be true or not. That’s not that transparent. As an example, Warrior Trading goes another way here. They even publish their bank account statements on their website. Make sure to check out our Warrior Trading Review where we reveal all you have to know about their trading courses and live trading room.